Local Arizona author Shelley Coriell started out working as a journalist and restaurant critic. Now she writes mysteries, romantic suspense, and young adult novels. I’ve met Shelley several times at local events. 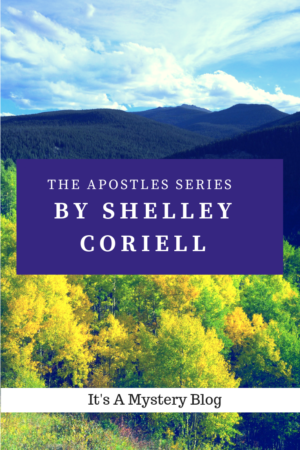 At one workshop she told a heartbreaking story about how The Apostles series came about. She was at the hospital where her father was recovering from a stroke and a bad accident with an ATV. Shelley’s sister was taking care of his health issues and her brother was taking care of the financial issues, so Shelley felt at a lost about what to do. She decided to provide a distraction by getting her father to help her flesh out a story idea she had. The three books below are the result of that hospital stay. The Apostles are a special group of handpicked FBI agents who work for a reclusive FBI legend named Parker Lord. Coriell introduced Detective Lottie King as a minor character in the first book of The Apostles series, The Broken. Lottie was so popular that Shelley decided to write more about her. By the way, Shelley is a bit of a foodie and she includes some Lottie-inspired recipes.